Abbotsford condos are available a wide range of prices and sizes, and are a great option to consider when planning to buy a new home. These condos have shown to be consistently excellent investments and many are close to schools, hospitals, and parks. No matter what features and amenities may be important to you and your family, we can help find a condo in a great location that is a perfect fit. Below are the complexes laid out by name. Clicking the links will take you to all the active listings within the complex name. Abbotsford condos can be found for as little as $82,000 and are available in all price ranges. These condos, which normally include 1-5 bedrooms, have great views and are close to local businesses and amenities—some even within walking distance. Most condos come supplied with appliances and are conveniently close to shopping, recreational centers, hospitals, schools, and transit. Depending on the building, some may allow pets and offer a wide variety of popular interior and exterior features. Abbotsford condos offer affordable living to people on any budget. Emerald Springs – 33280 E Bourquin Cr. Finding the perfect condo can seem like a daunting task. In today’s competitive real estate market, it is essential to know how to sift through the many listings posted every day. Using our Abbotsford MLS search feature may ease the process and narrow down what you’re looking for based on the criteria which are most important to you. No matter the current real estate market, condos are a sound investment for many people. For a first time home-buyer, an Abbotsford condo may be the perfect choice of real estate for you. Many Abbotsford condos come equipped with features and amenities unmatched by condos in other locations. Many of these properties are relatively new and are available in a loft style, with their open floor plans and comfortable, spacious windows. Some interior features in these condos may include skylights, granite counter tops, stainless steel appliances, and fireplaces as well as exterior features like balconies. Some condos are even available in seniors-only communities or are located close to schools and universities. Many Abbotsford condos in the higher price range offer spacious bedrooms and in-suite laundry. Some of these properties are available in gated communities and offer private fenced-in backyards and parking. These condos are all conveniently located and come equipped with popular features such as crown molding and high ceilings. Many of these well-maintained properties are new and evidence of the quality workmanship abounds in the beautiful interiors of these homes. Finding a condo in such a large market can be overwhelming and tiresome. Fortunately, with our comprehensive website and MLS search, we provide the best services to make the process as simple and easy to navigate as possible. Let us take the stress of shopping for a new home off your shoulders. 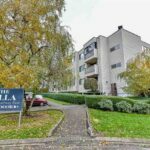 We have the experience and the knowledge of real estate and the area to help find the best Abbotsford condos for your budget.